Can you imagine having the opportunity of traveling the world? What souvenir would you buy to commemorate each of those destinations? Some buy snow globes, or magnets, or postcards. One gentleman bought Harley Davidson t-shirts. In total, he collected over fifty of these shirts but lacked any way of displaying them. That is where Joanne came in. She is a very generous woman and volunteered to make him not one, but several (she had 50+ shirts to use) quilts to show off his impressive collection. This is but one a half dozen or so quilts that she has brought to me to quilt for this man. I really like the use of gray in this quilt. The t-shirts really stand out and are the stars of the show with their brighter reds and oranges. I also think the use of the shadowboxes was a great touch. By using two darker shades of gray, she first framed each shirt and then echoed the frame. It brings the t-shirts forward a bit, making them stand out instead of settle into the quilt. It really centers the attention on the t-shirts instead of the fabric around them. She chose to use a pinched square spiral to complete the look which I think was brilliant. The pattern reminds me of the spiral pattern you see sometimes on highly polished metal. It fits the theme of the shirts wonderfully, adding another dimension to the solid gray fabric. Let’s be honest here, the man who collected these shirts may love this quilt because it reminds him of some of his travels. 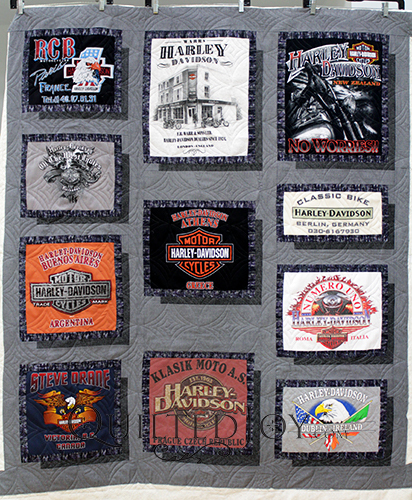 There is also plenty of Harley Davidson enthusiasts who would love owning this quilt because of the subject matter. But I think there are still plenty of people who would enjoy having this quilt simply because it is awesome. So cool! Some of you may notice that one of the pictures includes fabric not seen on any of the other pictures. She added t-shirts to the back of the quilt as well. To be warned, there is some danger in doing that. Any seams on the back are opportunities for pleats and puckers. The quilter can’t see what is going on behind the top to prevent it from happening like we can on the top. I think I did a pretty nice job, if I do say so myself. T-shirt quilts are wonderful ways to use and keep those souvenir shirts that get collected over time. It’s also a fun thing to collect as you travel around to all parts of the world. Next time you find yourself in some distant port of call, think about adding a t-shirt to your souvenirs. Previous post: Floral Quilts are Blooming! Next post: APQS Beginning Longarm Class is August 3!